It’s amazing how jailbreaking seems to go in waves. We have those busy spells where all we ever seem to hear about is new tweaks and apps hitting Cydia that should, hopefully, blow our minds and change the way we use our iOS devices. Then we have a period like the one that we’ve just come out of, where interest seems to wane and jailbreaking almost slips into hibernation. That spell often follows a big new iPhone release, mainly because that hardware comes alongside a new software release, and that means that jailbreaking often hits a roadblock while new vulnerabilities are found. That’s what happened with iOS 7. Now though we’re firmly on the other side of that dry period, and following the release of an iOS 7 jailbreak a few days ago we’re seeing tweaks get updates for the new operating system and even Cydia has had a lick of paint. It’s all very exciting. 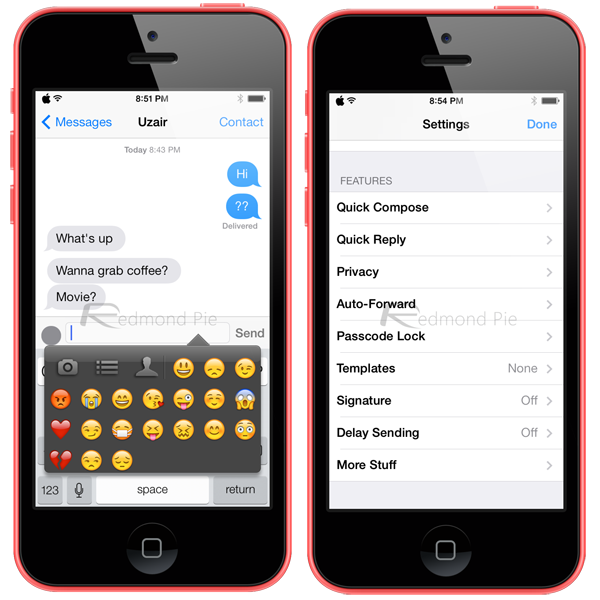 The latest to receive an iOS 7 flavor is one that we’ve been waiting for, and that’s BiteSMS. The official BiteSMS Twitter account tweeted a couple of days ago that the developer was hard at work to get BiteSMS for iOS 7 ready and out in the hands of beta testers. We were told that development was about 85% complete, and that a Friday release was on the cards. True enough, today is Friday and we’ve been treated to a beta release of BiteSMS 8.0.1. 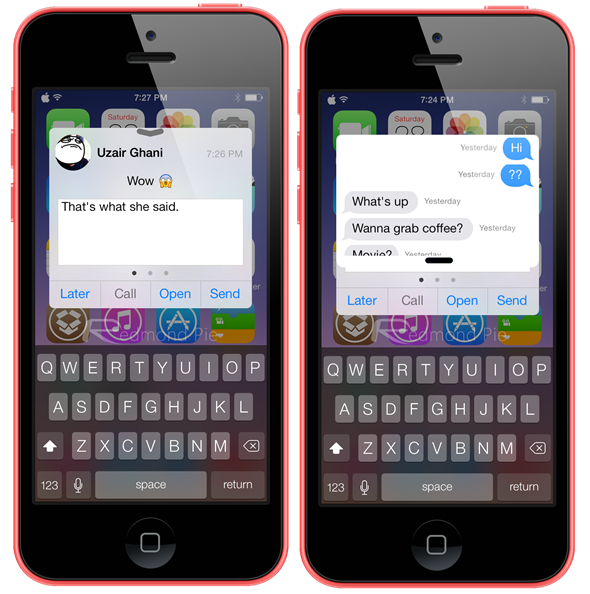 The update brings one of our favorite Messages app replacements to iOS 7, and even though the stock Apple app has received a few updates of late, we still can’t say that it comes even close to what BiteSMS has to offer. Being able to send quick replies alone is something we miss when we’re sans BiteSMS. Yes there are other apps that do a similar thing, but BiteSMS will forever have a place in our hearts. Now, here comes the interesting bit, although the BiteSMS app has always been a replacement app for the first party Messages app, but this time around, it literally replaces the app, making the Messages app no where to be seen, exactly the way it should’ve been from the beginning. The UI, as we’d come to expect from any app for iOS 7, is flat down to its roots. From the main UI to the message bubbles, it’s all flat. And white! The beta also provides the user the ability to send replies directly from Notification Center and lock screen as usual. For some this might not sound great, but if you’re asking us: it is, it really is. 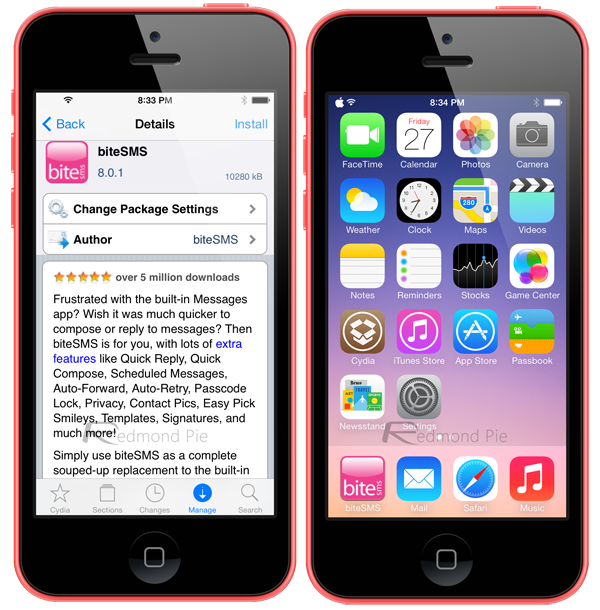 The new beta release can be downloaded now from the test-cydia.bitesms.com repo, and it’s absolutely free to try for a limited period of time and comes with ads, and we suggest you get right on it. Now! 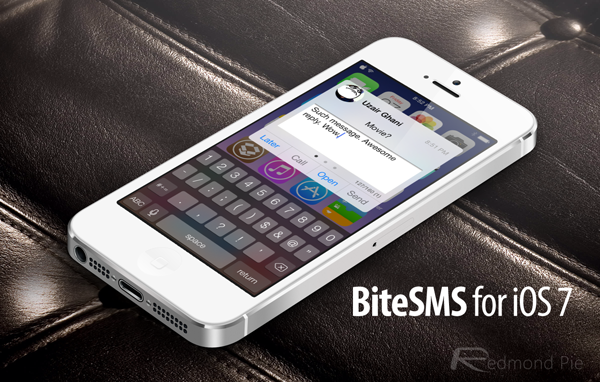 Update x1: A more stable and polished version 8.0.2 beta 2 of BiteSMS for iOS 7 is out now. You can download it from the same repo as mentioned above.